Times Higher Education has again recognized UMBC as one of the world’s top young universities through the Golden Age University Rankings. The goal of the ranking, which specifically includes institutions established 1945 – 1967 is to focus on visionary institutions that have quickly risen to prominence on the world stage—over decades rather than centuries. This year, UMBC comes in at an impressive #70 globally and #10 among U.S. universities featured. The Times Higher Education ranking comes just weeks after the Center for World University Rankings recognized UMBC as one of the top 3.5 percent of all universities worldwide. This latest list features 200 universities from 44 countries. Universities were featured based on the caliber of their teaching environment, research environment, citation impact, international outlook, and knowledge transfer (see methodology, shared with THE’s standard World University Rankings). Also featuring UMBC is a new list of Top Universities for International Students from U.S. News & World Report. This list focuses on U.S. universities that have a particularly strong commitment to supporting international students throughout their academic journey, providing them with the resources they need to achieve their goals and become a part of the university community. “We are excited and honored to be included in this new special ranking. 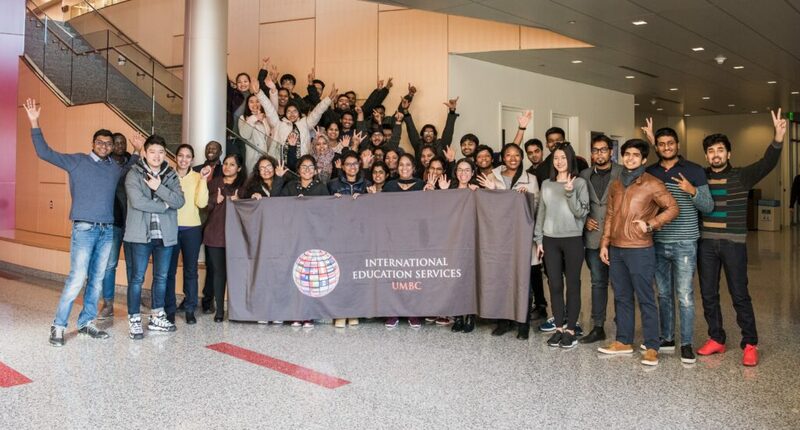 This is a testament not only to UMBC’s increasing global presence, but also our deep and continued commitment to the success of our international students,” said Yvette Mozie-Ross, vice provost of enrollment management and planning. Spring 2018 international student orientation. Of her UMBC experience, Escobar says, “I have taken classes with professors from different cultural backgrounds, professors whose first language is not English, and I have felt very supported and encouraged by them to continue the challenge of finishing my education in a second language.” She carried through that focus on support in her own work, presenting at Undergraduate Research and Creative Achievement Day an online tool to help students connect with peers for academic support. UMBC’s international graduate students also reflect on how a high level of faculty and staff support encourages their success. Ke He, Ph.D. ‘18, chemical, biochemical and environmental engineering (CBEE), originally from Zhejiang, China, has worked closely with faculty advisor Lee Blaney, CBEE, to advance his research on contaminants that impact water safety. He shares, “As an international student, the diverse and friendly circumstances in UMBC really helped me to settle down in this completely new environment.” With his Ph.D. now complete, He will continue his research through a postdoctoral fellowship at the University of Maryland School of Medicine. To determine their list of Top Universities for International Students, U.S. News drew from their Best Colleges ranking and assessed those institutions on specific indicators particularly geared toward international students. These included factors like the availability of international student organizations, housing and dining accommodations during holidays, and institutional need-based or merit aid for international students. U.S. News including three Maryland universities on the list, recognizing Johns Hopkins University and University of Maryland, College Park in addition to UMBC. He reflected, “As we aspire to increase UMBC’s engagement with the world, it is an honor to be recognized as a top university for international students.